Mike Massey's long awaited book has something for everyone. 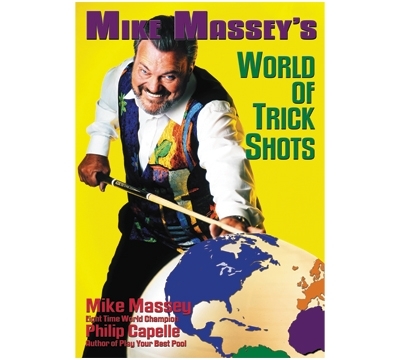 Mike teaches you how to set up and execute his arsenal of trick and artistic shots. Over 180 in all, each beautifully diagrammed. You'll learn hustler's specials, prop shots, crowd pleasers, great escapes, stroke shots, jump shots, masses, bank shots, mystery shots and much more. Every shot is rated 1-5 for execution and set up. Many of the shots will help you with your regular game including Mike's Power Draw. A big chapter is loaded with tips on how to give a show that will amuse and amaze your friends. Mike's Poolography (a poolplayer's biography) tells of his worldwide journey in pool. Over 25 cartoons by Dave Burton. Soft cover, 336 pages.